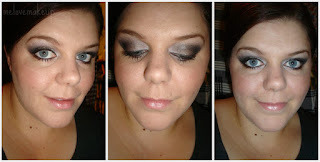 Sophsterlicious • UK Blog: Brown & Black Smokey Eyes. Another FOTD post here for you all.. I'm, not sure if these posts are boring or not? But when I do my make up I always take some pics to put on here if they're any good. Anyway, I wanted a kind of gradual white/brown/black smokey look and this is what I did. It's quite over the top but perfect for a night out I reckon. I love the shape of your eyes.